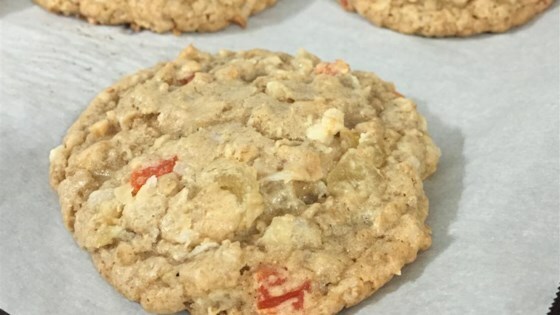 "Made these as an alternative to chocolate chip cookies and the kids loved them! You can mix and match the nuts and dried fruits you prefer. Store tightly covered." Preheat the oven to 350 degrees F (175 degrees C). Line a baking sheet with parchment paper; spread coconut on top. Blend granola in a food processor until finely ground. Set aside in a bowl. Toast coconut in the preheated oven until lightly browned, about 5 minutes. Let cool. Transfer to the food processor and pulse until finely chopped. Mix into granola. Add flour, baking soda, and salt; whisk until mixed evenly. Blend banana chips in the food processor until finely chopped. Transfer to a bowl; add macadamia nuts, dried pineapple, and dried mango. Stir until mixed evenly. Place butter, brown sugar, and white sugar in a large bowl. Beat with an electric mixer on medium speed until creamy. Add eggs, coconut extract, and banana extract; beat well. Add granola mixture and mix well. Fold in banana chip mixture. Drop rounded teaspoonfuls of the cookie dough onto ungreased baking sheets. Bake in the preheated oven until golden brown, 8 to 10 minutes. Cool on the baking sheets for a few minutes before removing to a wire rack. Let cool completely.